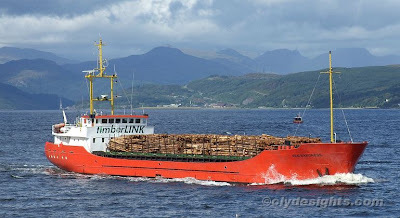 As the timber planted over the years in many parts of western Scotland reaches maturity, it is being harvested and sent to the pulpmills for processing. Much of this traffic is carried by sea,and coasters are regular visitors to the Holy Loch, where they load round timber from the former MoD pier at Sandbank, now operated by the Holy Loch Marina. One such vessel engaged in this trade is RED BARONESS, owned by Taylor and Taylor of Troon. Built in Holland in 1979, this neat little 1,450-tonne deadweight coaster was originally named HARMA, but adopted her present name in 2000.